8 customers were able to try this promotional product before it sold out at 4:20 PM on January 9. The regular, guaranteed lowest price on 125 of these notebooks would be $296 with set-up! Make the “write” choice for your next promotion! The colored cover is made from 250gsm paper. 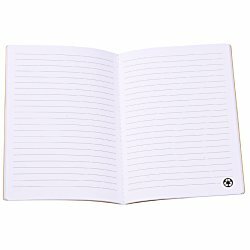 Journals are made with 30 sheets (60 pages) of ruled, recycled white paper. 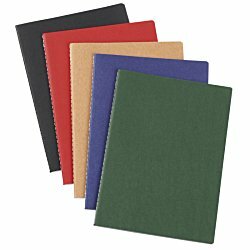 Notebook is stitch bound, providing extra durability and ensuring long-lasting use. A small recycling symbol in the corner on each page reminds them to always properly dispose of paper waste. Carry this slick and small notebook with it with you in your purse or briefcase. Tucks away easily for storage in desk drawers, purses or backpacks. Great for home, school or office use. Size: 7" x 5" x 1/8". Your price includes a one color imprint on front cover.